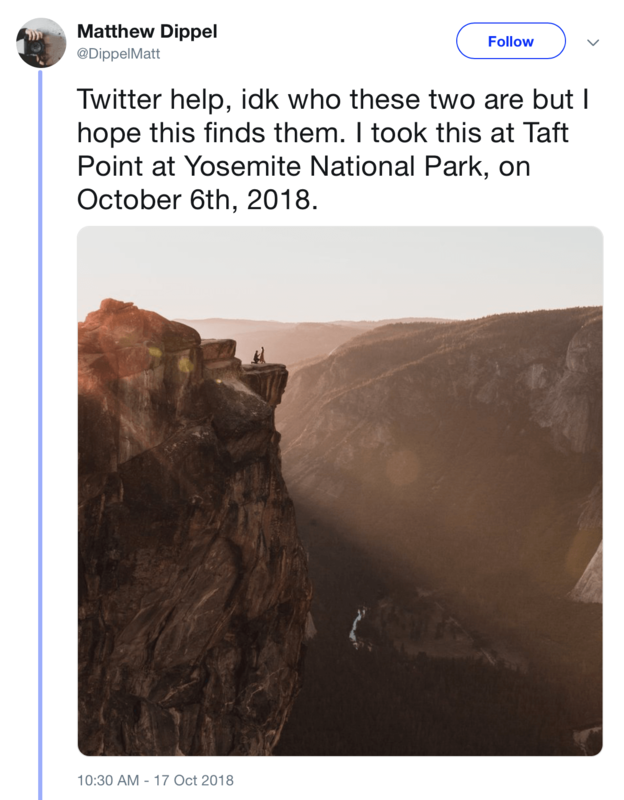 A photographer who was shooting earlier this month in California’s Yosemite National Park is turning to social media to try to track down a mystery couple captured in one of his photos. 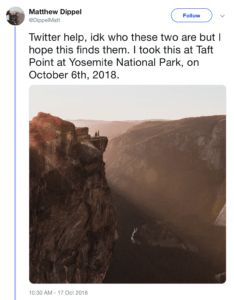 The photo, which you can see below, has generated a lot of buzz since photographer Matthew Dippel posted it on Twitter — but so far, the couple has not been found. The striking photo appears to show a man on his knee, apparently proposing to a woman in a dress. The photo was taken at Yosemite’s Taft Point on Oct. 6. I’m willing to wager that this is a set-up and a stunt of some kind. This picture is waaaaay too perfect and too coincidental. I get that you say that. We trust NOTHING anymore, do we?